Syracuse coach Jim Boeheim watches from the sidelines. Mandatory Photo Credit: Kicia Sears, The Juice Online. While the Syracuse defense kept Northeastern in check, Oshae Brissett did a lot of work on offense, piling up 21 points and 14 rebounds in leading the Orange (6-2) to a 72-49 win at the Carrier Dome. SU held the Huskies (4-5) to just 34 percent shooting on the night, including a meager 21.4 percent mark from three-point range. Brissett, meanwhile, was force throughout the game. The sophomore forward posted his second double-double of the season and 15th of his career, including grabbing seven offensive rebounds. Brissett’s board work keyed Syracuse to a 43-29 rebounding edge, including 15 offensive rebounds that turned into 19 points. While not shooting the lights out, particularly from long range, the Orange offense looked sharp most of the game. While Northeastern employed multiple zone defenses, SU’s offense featured lots of quick passes, resulting in a season-best 20 assists while committing a season-low seven turnovers. The first half was one of runs. Syracuse had the first, posting the first seven points of the night. Elijah Hughes rattled home a long three from the right wing to start things off, then Frank Howard made a steal and went the distance for a lay-in. Oshae Brissett set up Paschal Chukwu for an alley-oop and the Orange held a 7-0 lead just under two minutes into the game. Northeastern posted a run of their own, using the long ball to jump in front. The Huskies hit three straight three-point shots, the middle one as part of a four-point play, to pile up ten straight points for a 12-10 lead just under three minutes later. SU replied with an 11-2 burst to take a lead they would not give up. Brissett started the streak by rattling home a foul line jumper and Howard made a steal, then led Hughes with a long pass for a three-point play. Following a Husky score, Howard set up Hughes for a right wing three and Battle did the same for Brissett. The last triple gave Syracuse a 21-14 edge. That would prove to be the last Orange marker for over seven minutes, but Northeastern was only able to shave five points off the margin. SU posted the last nine points of the opening half for their first double-digit lead of the game. Jalen Carey converted an inbounds lob pass for a lay-up while being fouled, but missed the free throw. Buddy Boeheim coaxed a leaner from the foul line through the net, then Brissett hit from distance once more. Brissett then was fouled trying for a baseline jam, but made both free throws for a 35-23 lead at the break. Hughes hit a three to open the second half, making it a 12-0 run and a 15-point Syracuse lead. 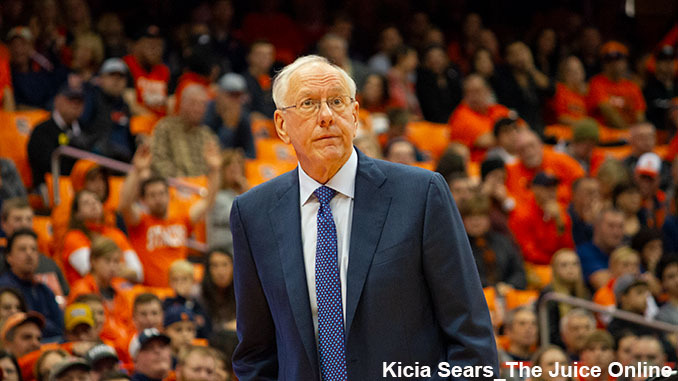 The Orange would hold control for the remainder of the game, pushing the margin to 20 points on a transition trey from Boeheim, then to 22 when Carey made a steal and dropped in a breakaway dunk with just over seven minutes to go. SU would stretch the lead to 72-47 in the game’s final minutes with a 10-2 run. Chukwu had the first five points of the span, including another alley-oop dunk. Boeheim cashed in another three and Robert Braswell dropped in two foul shots to finish the burst. A Northeastern basket with under 30 seconds on the clock finished the scoring. In addition to Oshae Brissett’s strong effort, Elijah Hughes bounced back from an off night in his last outing to finish with 17 points, including hitting three triples. Buddy Boeheim carded his first double-figure night at SU, also hitting three times from deep for most of his 11 points. Pachasl Chukwu chipped in with eight points and seven boards. Tomas Murphy paced Northeastern, posting team highs of 17 points on 7-of-10 shooting and eight rebounds. Donnell Gresham added ten points, hitting three triples along the way, and Jordan Roland added nine. SU will return to action Saturday when traditional rival Georgetown visits the Dome. The Hoyas, who have won their last four games, will bring a 7-1 record into the contest. Center Jessie Govan and guard James Akinjo are the top players for Georgetown. Govan leads the team in both scoring and rebounding with marks of 19.5 points and 7.6 rebounds per outing. Akinjo averages 14.1 points and 4.9 assists per game with a team-high 12 threes on the young season. The Orange and Hoyas will renew their rivalry Saturday at 3:30pm Eastern with ESPN handling television duties. The game will be available online at ESPN3.com.